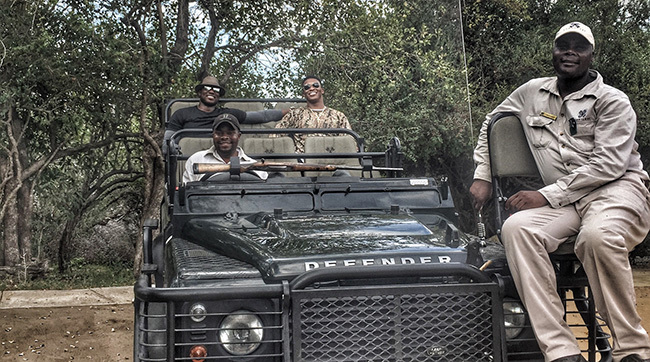 DeMarcus, Demaryius, De'Marvin and De'Melvin saw the Big Five African game animals while on safari. WARE: Demaryius and I thought of the idea to go to South Africa way back during training camp. I usually try to find something to plan during the season to take my mind away from football. 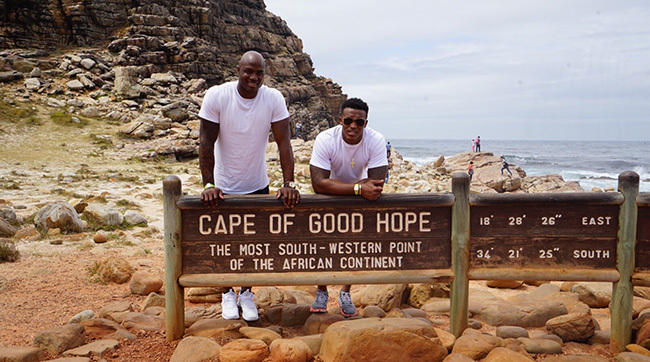 I was talking to Demaryius and he said he’d like to go to Cape Town and see Africa, because he had never really left the U.S. and neither of us had been to Africa. I thought that would be great to do during the season, because we could use Tuesdays when we are off to plan it, and to take our mind away from football. THOMAS: I let DeMarcus plan most of it, because he was the older guy and it was his idea first. I was going along with it because I wanted to do something different because I haven’t been outside the U.S. much, just to London with the team in 2010. I want to visit all seven continents, so it was perfect timing. Not everybody gets a chance to go to Africa, so I took advantage of it. 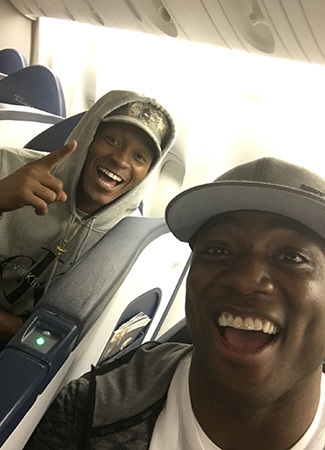 WARE: Demaryius is like a younger brother to me, so it was natural for us to plan a trip like this together. During the season we had something to look forward to because every week we would think of some type of adventure or something that we could do in Africa. But we also decided that the only way we would go on this trip is if we won the Super Bowl. We said, if we win that Super Bowl, then we’ve earned another prize, a trip to Africa. THOMAS: Von [Miller] didn’t think we would go at all. He kept saying, ‘You know y’all ain’t going if we win, there will be too much going on here.’ He kept putting it in our face like, ‘You know y’all ain’t going to go.’ A couple other guys were talking about going to the NBA All-Star game, and I was like, I have a lot of chances to do that later, I’m going to go South Africa. D Ware and DT board the plane, headed for somewhere much different than Disney World. THOMAS: That was my first time being on a flight that long, it was like 17 or 18 hours. We flew into Johannesburg and then we had to fly another two hours to Cape Town, and I was like, Man, I’m kind of over flying now. WARE: We got there to Cape Town a little late. We had rented out two little villas at the place we were staying. We get there and they open up the rooms for us and I see this huge chandelier. And I’m like, okay... Are we in the lobby? And they said, no, we upgraded you guys for winning the Super Bowl. THOMAS: That was amazing. We’d wake up in the morning and see the mountains, and at night the sunset was right there. THOMAS: On the first day that we were in Cape Town, we posted one picture on Instagram. And right away Larry Fitzgerald texted me and sent me pictures from when he was over there. He said, ‘If you need any suggestions I’ve been there four times.’ I couldn’t really say much because our whole trip was already planned, we had a whole itinerary, but he gave us ideas for places for good wine and good food. He was so excited that we were over there, it was funny. WARE: Larry suggested Cape of Good Hope. I got some travel advice from some other guys in the league who have been there before and travel a lot, like Larry and Miles Austin. There’s sort of a fraternity of guys in the league who like to travel. WARE: We also went to some vineyards, because I love wine and seeing how it is made in different parts of the world. We went to the Cape of Good Hope and Cape Point, the most southern parts of the continent. We traveled around a little bit. 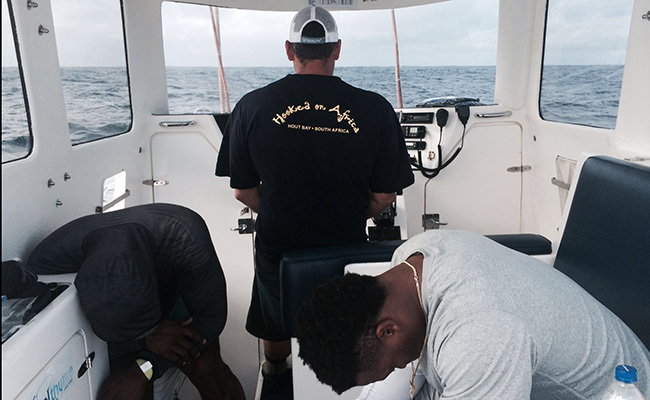 We also went deep sea fishing which was… an experience. Seasickness got the best of the Super Bowl champions. WARE: I said to Demaryius, ‘I’m about to give it up!’ I run over to the side of the boat and throw up. I come back to the middle of the boat and I look at Demaryius and I’m just watching him like, he’s going to throw up any minute. And then all of a sudden he looks at me and he’s like, ‘OH!’ And he takes off and goes on the side of the boat. THOMAS: D Ware caught one fish and then it was my turn, but I made him catch the second one because by that point, I was like, ‘No bro, I’m good.’ I was just sitting there holding my stomach. We sat out there for like three or four hours. At one point I had a bucket because every 20 minutes I was going again. I was so shaky once I came back, and I was like, man I’m not going out on the water again for a long time. I ain’t playing with that again. WARE: This trip was more than a vacation. It was a real learning experience for us. We went to Nelson Mandela’s jail cell on Robben Island and took a tour and learned about how the prisoners communicated, how they knew what was going on outside of the prison cell, how they spoke in different languages so the prison guards didn’t know what they were talking about. THOMAS: If you were a prisoner and you try to sneak away, where are you going to go? You’ve got nothing around you but water. You don’t need any guards. That touched me. Mandela was so isolated, they didn’t want him to be around any people because they didn’t want him to get messages back into South Africa. 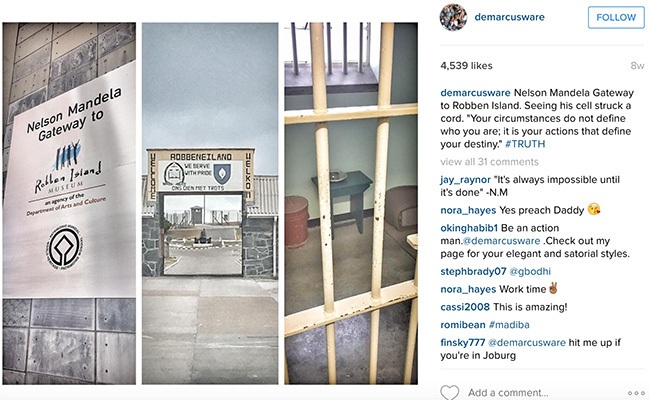 From Ware's Instagram: "Langa township. Oldest apartheid scheme in the Cape. 6 rooms to a building, 15 people per room, 3 beds per room. 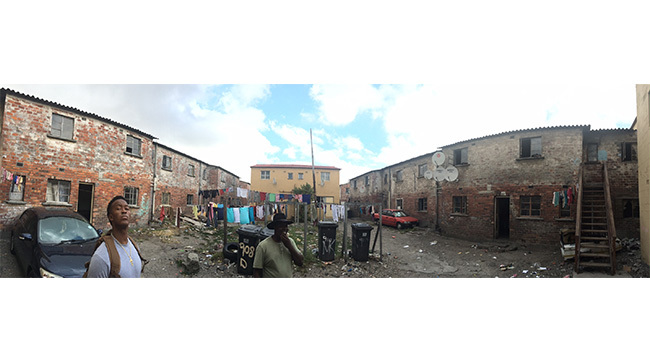 #EyeOpening"
WARE: After that we visited Langa Township—[an area outside of the city that had been designated for Blacks during Apartheid]. It was one of the most poverty-stricken places we have ever been in our lives. We realized how privileged we are in what we do. When you see how the people lived there, it makes you want to pray that things can be better at that place. We want to bring awareness to this place because it’s crazy, the way those people live. We’re all people, just the same. I want to help, we talked about it a couple days ago, Demaryius and I said we need to go back and help those people and we are still thinking about it to this day. THOMAS: That was tough. The main thing that touched me was every time I saw somebody who was always smiling. They didn’t care where they lived or what they were wearing. I saw this little naked kid running around and he was so happy. This little boy walked right up to me and held my hand for a second. He walked with us from house to house, and that level of poverty is something you never see in the United States. I don’t care if you go to the worst part, that area is still worse. They were in little shelters right beside each other. Some families have three kids and they stay in this house that can barely fit them and they just find a way to be all happy and smiling. And that just touched me because when I was growing up, we didn’t have it all either. WARE: Taking a trip like that was important because we were in areas where our ancestors came from. There’s a lot of history there. We saw and experienced some things that really touched our hearts and it made us realize how privileged we are, but also how much we can help out where a lot of our ancestors came from. WARE: We went to Sabi Sands game reserve and spent three days on safari, and stayed in a lodge there. We had two guides with us, named Marvin and Melvin. Because we are Demaryius and DeMarcus, they decided to be funny and change their names to De’Marvin and De’Melvin. WARE: DeMarvin and DeMelvin are some of the best trackers out there. These guys know exactly where the lions were from 10 miles away. They know from the smell, they know exactly what time they came by. They found every single animal in about ten minutes. ‘Look at these paws, look at the dung, you smell that? They are ten min away!’ We didn’t even see any sign of an animal and we drive on and sure enough, there is the leopard in the tree, just like they said. It was incredible. WARE: He just had a stick in his hands when he got off the vehicle—no weapon, no gun. He said to me, ‘DeMarcus, I live this. I know exactly what these animals can do, I know what makes them attack. I am a protector of God’s animals.’ It was amazing how much they knew about the animals, and how simple their lives were. 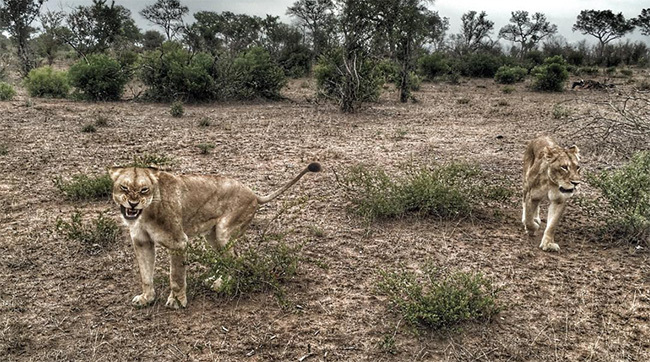 THOMAS: One night we saw the lions on a chase, they were looking for another lion in their territory. 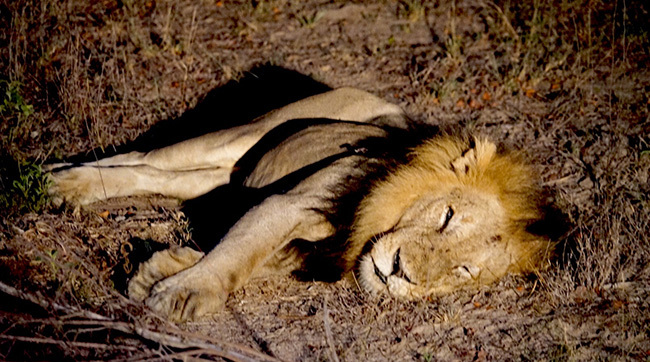 It was dark outside, and the lions got so close to our vehicle. It was scary the first time they passed by, but to see them in action was so cool. I’m glad they didn’t catch the invading lion, because I didn’t want any animals to get killed while I was there, and it was four lions against one. 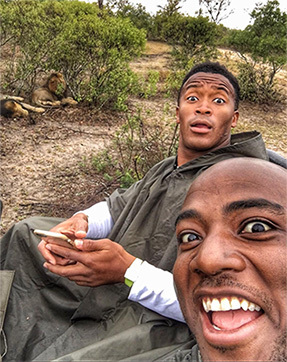 The Broncos met a lion while in South Africa. WARE: And that wasn’t even our craziest animal experience. When we first got there, they told us to make sure to lock the door to your room because if you don’t, the baboons will open up your door and go and get your cookies. So I’m like, alright, cool. I was getting a massage in my room one of the days and I didn’t lock the door. 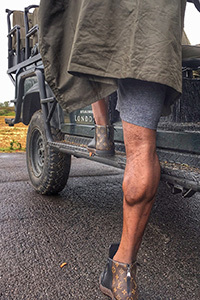 All of a sudden during the massage, the masseuse, she yells, ‘GET OUT!’ And I look up and see a baboon as big as me, standing in the room on his four legs. And he was screeching out really loud, and baring his big huge long fangs, bigger than a lion’s fangs. He jumps up and tries to grab a cookie and she gets a pillow and throws it at him and he takes off running. She’s like, ‘That baboon never listens to me.’ It was like a normal day for her. She wasn’t even intimidated, but I was intimidated, that thing was huge! He was like my size! Then, about five minutes later, he comes up and knocks on the door again. He knocks on the door like a human! I’m like, are you freaking kidding me? And for the three days after that, he knocked on the door every day at the same time. THOMAS: I’m glad those baboons stayed around D Ware and not me. We learned you gotta be careful with those baboons now. Every night after dinner the guides had to walk us to our room with a light because basically any animal can get up to the lodge. There could be lions and leopards up there, so I always made sure they walked me to my room. WARE: I made sure to bust out my Louis Vuittons for safari. When you go into a Louis Vuitton store, they use those big boxes in their displays and all the suitcases and it just looks like safari stuff. So I went into the Louis Vuitton store, and I was like, ‘I’m going to get me some LV shoes, this looks like this is safari stuff.’ I was being funny and I took a picture because they looked so good out there. WARE: This was was one of those trips I dreamed about for a lifetime. You always want to go out there and experience something new. Africa is so big and it is so diverse in so many areas. I picked that area because I wanted to go to a place that is so out of the box of the U.S., to experience new things and broaden the mind a little bit. I love traveling during the offseason because sometimes you have to get away from all hoop-la to appreciate life. Just the intensity of life in general, sometimes you have to go somewhere where things are very simple. You can buy all the trinkets in the world and they will tarnish over time, but memories are everlasting. Broncos coexisting in lion territory. THOMAS: As the days went on, it was like, man, I want to stay a little longer. When I got back I was so happy, I felt a change big time. My vibe was totally different from being over there than over here. It was so beautiful over there, but then you go to some parts where you see people who don’t have much but they are always smiling no matter what. They make it work with what they have. I’m so happy I went over there. It was a gift, not just an exciting trip, but we were able get some knowledge about animals and history. WARE: It was one of those amazing trips where you realize, man, it is a broad world out there.